Pictured: Representatives of Kinefac Corporation with Senator Moore (L-R): Leslie Greis, Arun Basil, Senator Michael Moore, Will Desrosiers, Mark Penniman. BOSTON – Senator Michael O. Moore (D-Millbury) announced that Kinefac Corporation received a manufacturing award for their innovative and dynamic manufacturing processes. As a member of the Legislature’s Manufacturing Caucus, Senator Moore nominated Kinefac for the statewide recognition earlier this year. A family-owned business, Kinefac was founded in 1962 by the late Howard A. Greis and has since passed to a second generation of ownership. The company makes sophisticated machines that shape and form metal into very high precision parts for applications in many industries. Everything produced by Kinefac is designed, engineered and manufactured in Massachusetts. Kinefac was one of twenty-seven companies in Massachusetts awarded by the Manufacturing Caucus for their manufacturing achievements. Manufacturers could be nominated for either of five categories including: job creation, education, sustainability, production, and innovation. A formal awards ceremony was held at the State House to provide legislators with an opportunity to acknowledge manufacturers from their respective districts that stand out as employers, innovators, and model businesses. Formed in August 2014, the Manufacturing Caucus includes more than 40 legislators from across the Commonwealth. The goal of the caucus is to increase Massachusetts’ competitiveness in manufacturing through legislative initiatives including efforts to close the skills gap. Lawmakers focus on training for manufacturing employees, helping start-ups access innovative resources, and expanding apprenticeship opportunities in key manufacturing sectors. 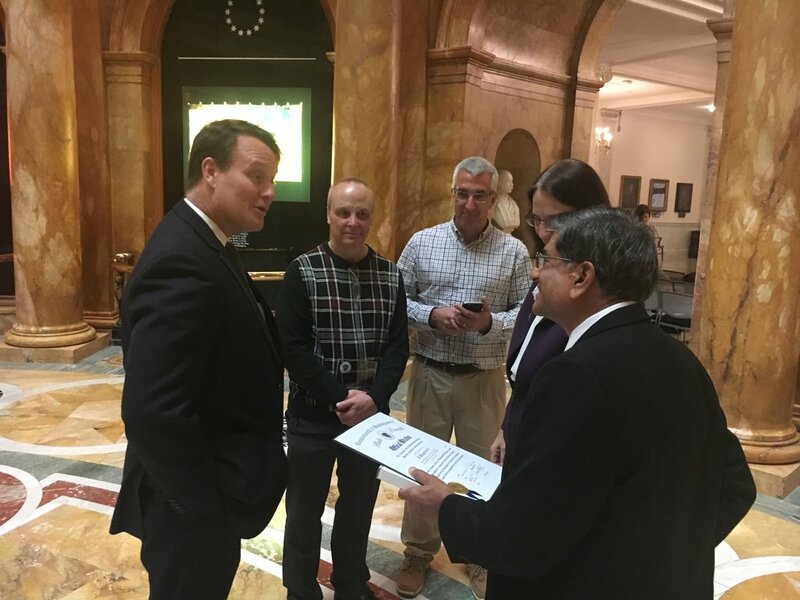 Pictured (L-R): Legislative Manufacturing Caucus House Chair, Representative John Fernandes (D-Milford), with Senator Michael Moore, Arun Basil, Will Desrosiers, Mark Penniman, Leslie Greis, Housing and Economic Development Secretary Jay Ash.